The Pembertons hack their timber empire out of the North Carolina mountain wilderness in Serena by Ron Rash, narrated by Phil Gigante. Serena and George meet in Boston, and their instant connection and passion drive them to flout the calls for a National Park System in 1929 to create the Great Smoky Mountains National Park. They effectively take action to buy up more and more land to prevent its creation. Serena is seen by her husband and the workers as a shrewd businesswoman capable of making deals and expanding the business. Serena and George are connected in business, love, and obsession, but when George begins to look on something else as more important, a woman scorned can be hard to appease. Gigante’s narration is superb, even as he narrates the female characters. His voice never takes on a ridiculous tenor as he takes on the persona of Serena and George’s former paramour. In a world where deals are made over bourbon and cigars, a woman is not expected to be wiser than them. When Serena takes things too far, George has to make a decision, which could put him at odds with his strong-willed, wild wife. 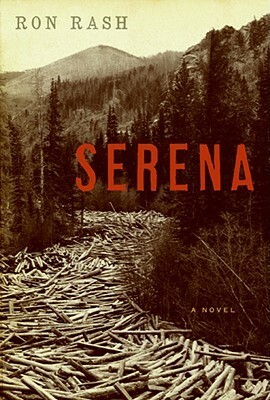 Serena has few redeeming aspects, and in fact readers may even fear her as many of the other characters do. She’s an imposing presence, even when she is not front and center in the action. Serena by Ron Rash, narrated by Phil Gigante, is a tale of ambition in a time when the Great Depression has taken a deep hold on the country, and it extrapolates how easily business tycoons can manipulate deals and people to get what they want. Ron Rash is the author of the 2009 PEN/Faulkner Finalist and New York Times bestselling novel, Serena, in addition to three other prizewinning novels, One Foot in Eden, Saints at the River, and The World Made Straight; three collections of poems; and four collections of stories, among them Burning Bright, which won the 2010 Frank O’Connor International Short Story Award, and Chemistry and Other Stories, which was a finalist for the 2007 PEN/Faulkner Award. Twice the recipient of the O.Henry Prize, he teaches at Western Carolina University.